Hong Kong is a free port where commodities reach across the globe without tariff mainly aiming seasonal sales. Fit to every ones taste and budget it is indeed a shopping paradise. All districts of Hong Kong has Malls and departmental stores. They are usually centrally located with pleasant atmospheres having individual & chain of restaurants and cafes. Tourists also enjoy courteous and professional service at affordable prices. All worldwide brands are seen here ranging from dresses, audio videos, watches, Jewelleries, leather wares etc. Every season,Grand fashion shows are hosted to attract tourists and introduce new fashion trends and items.Commodities in Central area are premium and hence price also bit costly here.The locals usually go for shopping in Tsim Sha Tsui and Causeway Bay. Those who look for further cheaper goes to Yau Ma Tei and Mong Kok. Street-side stands are seen everywhere. One can bargain for the best dealin Ladies Street, as well as in Temple Street night market and Central and Jade market in Yau Ma Tei. Major credit cards such as Master card, Visa, Diners etc.are accepted at almost all stores.The markets will be busy from dusk until around 10:30 pm depending upon the weather. Leather & related articles, shoes,cloths and clothing accessoriesare inexpensive but always trendy. 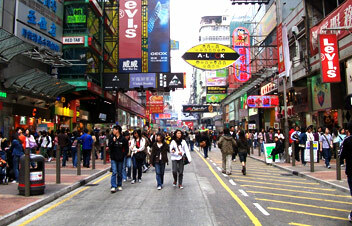 Ladies Street, is a well-known shopping area in Mong Kok area where a lot of tourist visits. Some streets are exclusively for a particular type of item, Nathan street on Kowloon sells only Gold, Sai Yeung Choi Street in Mong Kok is foraudio and video equipment; and Hollywood Road is famous for its antique stores.Computers and peripherals are sold in Mong Kok, Wan Chai, Causeway Bay and Sham Shui Po. 1.Before buying a product, always make sure the product you want to buy is in orderincluding features, model, prices and accessories and the guaranteed and warranty. 2. Bargaining can be fun in small shops and market stalls whereas most of the bigger shops works on fixed rate basis. 4. Always ask for receipts and guarantee warrantee documents. 5. If you are paying by credit card, keep a copy of the slip with you. Some banks or credit cards companies charge a currency-exchanging fee if it is overseas cards. 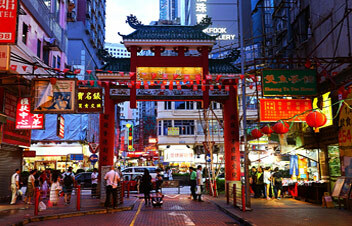 Main shopping areas in Hong Kong Island are Causeway Bay, Sheung Wan, Stanley, Wan Chai, Tsim Sha Tsui. In Kowloon East and Kowloon West are Mong Kok, Sham Shui Po, Yau Ma Tei and Lantau. Apm, China Hong Kong City, Citygate Outlets, Cityplaza, Design Gallery, ELEMENTS, Fashion Walk, Festival Walk, Harbour City, Horizon Plaza, Hysan Place, IFC Mall, Island Beverly Center, iSQUARE, K11, LANDMARK, Landmark North, Lane Crawford, Langham Place, Lee Gardens One & Two, Lee Theatre, Maritime Square, Marks & Spencer, MegaBox, Miramar Shopping Centre and Mira Mall, New Town Plaza, Olympian City, The One, Pacific Place, The Peak Galleria, The Peak Tower, Plaza Hollywood, Sincere, SkyMart and SkyPlaza, SOGO, T Galleria, Telford Plaza, Times Square, tmtplaza, Tsim Sha Tsui Centre and Empire Centre, V city, Western Market, Wing On Department Stores, Wonderful Worlds of Whampoa, wtc more, Apliu Street Flea Market (Electronics), Bird Garden, Cat Street (Antiques), Cheung Sha Wan Road (Fashion), Chun Yeung Street (Wet Market), Dried Seafood Street and Tonic Food Street, Flower Market, Goldfish Market, Gough Street (Designer Homeware), Granville Road (Fashion), Jade Market and Jade Street, Jardine's Crescent (Street Market), KoShing Street (Chinese Medicine), Ladies' Market, Li Yuen Street East and West (Fashion), Shanghai Street (Kitchenware), Sneakers Street, Stanley Market, Tai Yuen Street (Toys) and Temple Street Night Market.